My mom fell. Such a simple sentence. Three words. But, it’s like the dividing line between before and after. It happened about a year ago. She fell in the icy grocery store parking lot. She was on the ground between two cars. It was the middle of the afternoon, and while it wasn’t super busy, there were definitely people around. None of them saw her, and none of them heard her. She was so afraid - of freezing to death, of being run over if the other car didn’t notice her and backed out. And she was in so much pain. She lay there for nearly 40 minutes, until the owner of a neighboring car came out of the store and thankfully noticed her. Physically, it could have been so much wo.. Most people know that as we age, the risk of falling increases. About one in four people aged 65 and over fall each year, and that risk grows as people reach their 70s and 80s. You may not be aware that the risk for falling also increases when you travel. Navigating unfamiliar places, perhaps at night when visibility is poor, or while fatigued, or while carrying luggage or bulky packages, increase the risk of tripping or getting off balance. 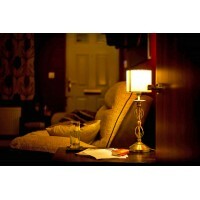 Even something as routine as getting up to use the bathroom is more risky in an unfamiliar place. 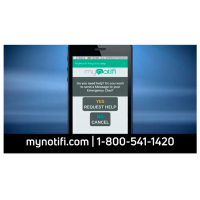 The first rule of thumb is to invest in a MyNotifi emergency alert device and fall detection, that will automatically alert family and fri..
MyNotifi pushes the envelope with its easy-to-use automatic fall detection, according to a recent feature article. The story by Chris Boyle, called "MyNotifi: High-Tech, Easy-to-Use Wearable Pushes the Envelop in Safeguarding Seniors from Falls, Medical Emergencies," was published in October in Long Island News. We are proud of the work we do in protection seniors from falls, and we're proud to share the story with you. "MyNotifi is a remote fall-detection device that circumvents the need for call centers." “As we age, we all fight that growing feeling of vulnerability and struggle to cling to our independence, but as time continues to pas..
Help, I haven’t fallen….but I need HELP! I’m not normally someone who likes to ask for help, or even talk about my health. My personal business is my personal business. But, I have to tell you about this one time that I had to admit I really needed help, and what happened after. So, about a year ago, I fell. It just happened one time, and I didn’t think much of it. But my wife sure worried about me, so when she heard about MyNotifi automatic fall detection and help device, she got me one. It’s a tiny gadget that clips to my belt, and most of the time I forget I even have it on. Well, last week I was having some back problems. I was sitting on my recliner with a heati..
Falls are a dangerous health epidemic, particularly among our aging population. So, when we learned that the National Council on Aging has designated the first day of fall (September 22nd) as National Fall Prevention Awareness Day, we wanted to spread the word. You see, at MyNotifi headquarters, fall prevention and fall protection is always on our mind. MyNotifi has spent the past few years perfecting an automatic fall detection wearable technology designed to alert family and friends if a fall occurs. But, MyNotifi is more than just fall detection. The MyNotifi app can also guide the wearer through a series of movements and range-of-motion training videos to potentially decreas..
At 82, my mom had fallen twice before, so she was careful to avoid unnecessary risks. When she needed something from a high shelf, she asked my dad to get it for her. She drove, rather than walked most places. So when she fell for the third time, it took all of us completely by surprise. “It wasn’t like I was out climbing Mount Everest,” mom recalled. “I was walking from the parking lot into the library”. She fell on her way to the front door. My mom’s biggest fear had always been falling if she was at home alone. “This was in the middle of the day, in a public place,” she told me. “You’d think it would be easy to get help.” But Mom was on the ground for hours before so..
As we age, falling becomes a bigger fear and it’s not unrealistic to be concerned. Studies show that one in four people between 65 and 74 will fall each year. That number goes up to one in three for people 75+. And if you’ve fallen once, your odds are increased for falling again. Falling can lead to serious injuries, loss of independence and costly medical bills. When you’re unable to get up or get help quickly, that “long lie” makes the situation even more dangerous. Untended injuries, dehydration, anxiety and elevated blood pressure increase the risks that a fall will lead to hospitalization, nursing home admission, and even death. But there are some things you can do to keep you..
We’re so excited to share the amazing technology and user experience of MyNotifi, that we’ve taken to the airwaves and your favorite news shows. MyNotifi is MedHab’s next-gen wearable fall detection device. It’s going to bring safety and peace of mind to millions of seniors everywhere–but only if they know about it. That’s why we’re hitting Television screens and radio channels nationwide. When people learn that MyNotifi not only detects falls and automatically calls for help, but that it does so without a landline or monthly subscription fee, they’re going to realize that MyNotifi is peace of mind and connection for the whole family. Watch our live in..
​Johnny Ross, the creator of MyNotifi, a brand new, mobile fall detection wearable, was selected for an exclusive interview with Gary Barg of Today’s Caregiver, an online magazine for family and professional caregivers. The topics were aging, independence, fall detection and technology. Ross had a chance to explain how the MyNotifi fall detection wearable works. He explained that MyNotifi is a technology game changer in an industry of push pendant necklaces, standard call centers, fees and stigmas. MyNotifi is a fashionable wristband or belt-clip wearable technology, which can automatically detect a fall, and doesn’t require a button to be pressed. It simply works. When a fall is detec.. The Truth About Falling. Don't Fall for These Myths. We’ve all heard the saying that ignorance is bliss, but that sure isn’t true when it comes to your health and safety. The more you know about the risks of falling, the better prepared you can be. But you may be surprised to discover there are some big myths out there when it comes to falling. 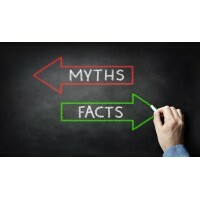 MyNotifi went to work to debunk these 5 common myths! Myth #1: Falling is not a big deal. If I fall, I’ll just get up again. Fact: Sure, it’s true that some falls aren’t serious, but many falls are very serious and can be an indication that additional falls could follow. In fact, falls are the leading cause of non-fatal, and also fatal injuries for Americans over 65. And even if the injuri..